Ask about our short-term booking specials! Wedding dates less than a year away are eligible for discounted rates. How far in advance should I book my event? How do I find out if my date is available? 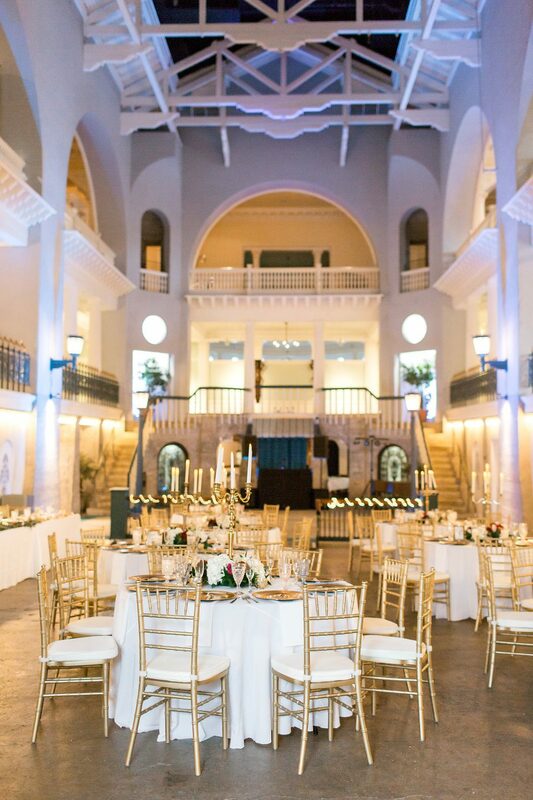 The Lightner Museum only hosts one event per day in the Historic Pool, Mezzanine and Outdoor Terrace, so dates do book up very quickly. Saturdays during peak months can book up more than a year and a half in advance! Please contact us and we would be happy to discuss availability for your event. Does the Lightner Museum offer discounted rates at certain times of the year? Yes! Our rates at Lightner Museum vary depending on how far in advance that you book with us. Short-term bookings (bookings less than a year in advance) are eligible for discounted rates. Fridays and Sundays are also considered off-peak days of the week. Rates on these days of the week are lower than our peak Saturday rates. Please contact us for additional details and availability. Does Lightner Museum have a space for a wedding ceremony? Is rehearsal time provided for my event? Yes! The stunning Historic Pool is the perfect setting for your wedding ceremony. Your ceremony booking also includes rehearsal time. Most rehearsals occur the day before your event. We try to be as flexible as possible depending on our event schedule and secure your rehearsal time at 45 days out.